Aphids Homoptera, Aphididae – There are many species of aphids known to be pests. Most species are similar in feeding habits and reproduction. 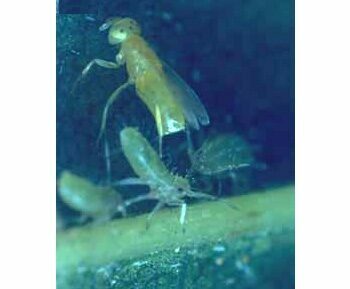 Feeding Habits – Aphids feed on plant sap by inserting their mouthparts into plant tissue. 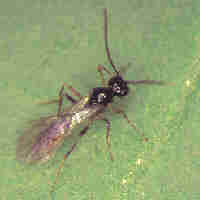 They excrete a sugary liquid, or honeydew. The honeydew not only clogs the pores of the leaves, but also encourages the growth of black, sooty mold, which can prevent light from reaching the photosynthetic tissue of the plant. Aphids weaken the plant by draining it’s fluids, may cause severe distortion of growth, and are common means of transmitting plant viruses. The body structure of aphids is simplified to perform only the functions of feeding and reproduction, while retaining the ability to walk. Even wings and flight muscles are dispensed with, except when these are needed to escape to a new food source. Thus all nutrition is directed to the needs of reproduction. Reproduction – During favorable climatic conditions, all aphid young are born female and therefore all will contribute to population growth. The young are born fully formed and able to feed immediately. They grow rapidly, molting (shedding their skin) 4 times before they mature, often reaching maturity within a week. 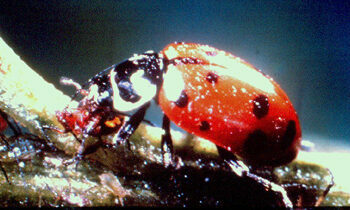 Because fertilization is not required, ova can start developing within an aphid as soon as, or even before, it is born. Young are then produced at a rate of 3 to 6 per day. 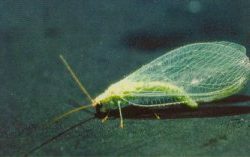 Within a greenhouse, environmental conditions are favorable, host plants are plentiful and the natural enemies of aphids are usually absent. 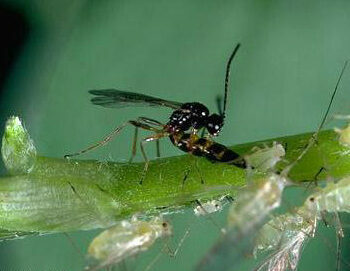 An aphid population is therefore able to grow geometrically for a considerable period of time.